Do you want the benefits of a wood privacy fence without the annual maintenance? The solution is a Vinyl Privacy Fence. You get the privacy, the curb appeal, the increased home value, and the added security without the seemingly constant painting and staining. That is what we like to call a win-win. 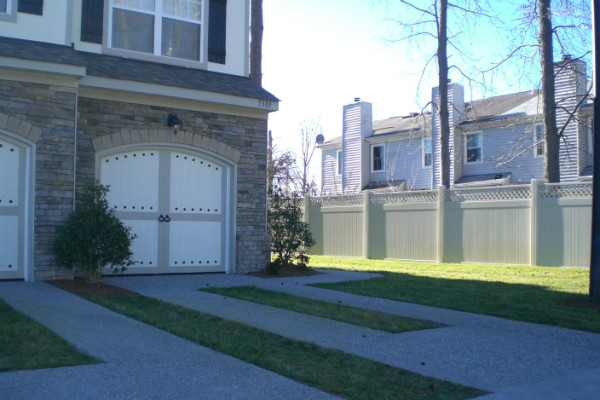 A vinyl privacy fence will greatly improve your home’s Curb Appeal. A privacy fence is called a privacy fence for good reason; it will improve the Privacy of your yard. Vinyl, unlike wood, is incredibly Low Maintenance. Vinyl fences are also very Durable and Flexible. A privacy fence will help cut down on the Wind and Noise Pollution in your backyard, which is great for that homeowner that enjoys throwing parties and barbequing. Believe it or not, vinyl fences are even Affordable. Privacy fences are Built to Last. Best of all, a vinyl fence will boost your Home Value, making your home easier to sell. Vinyl fencing has become very popular over the years and you can clearly see why! If you have any questions about a new Vinyl Fence, please contact Hercules Fence of Northern Virginia today by calling (703)551-2609 or visiting our website. Also, check out Hercules Fence of Manassas on Facebook,Twitter, Google+ and YouTube! This entry was posted on Tuesday, December 24th, 2013 at 4:13 pm. Both comments and pings are currently closed.